The Giant Prickly Stick Insect, also refferred to as Macleay’s Spectre Stick Insect, is a large stick insect from Australia and New Guinea. Its scientific Latin name is Extatosoma tiaratum. Like almost all stick insects it has a Phasmid Study Group number or psg number: psg 9. 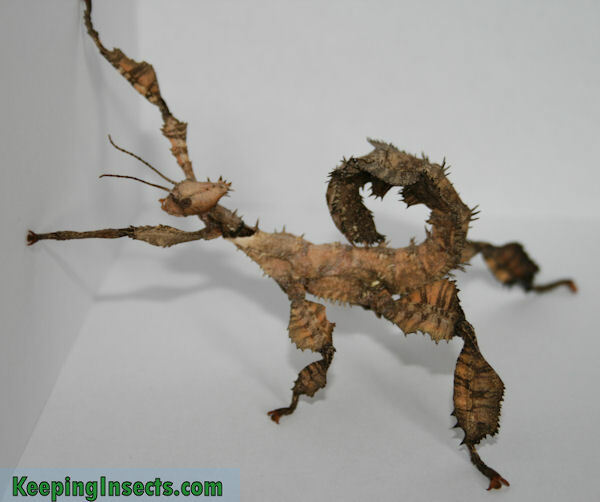 This is a very popular species of stick insect, because of the large size and amazing camouflage. This is a subsubadult female nymph of Extatosoma tiaratum. This species of stick insect looks more like a cactus than like a twig. Its body is bulky and covered in small spines. On its legs it has big lobes that are also spiked and look like leaves of a desert plant. Extatosoma tiaratum are often light to mid brown, but occasionally you can find green, beige or dark brown varieties. There is also a rare “lichen” type color that can be found in some young Giant Prickly Stick Insect females. 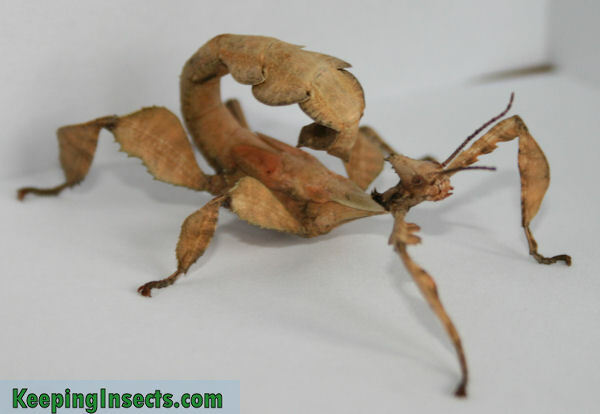 Their color depends on the conditions in which they are kept, but it is not entirely sure which conditions you need to provide to induce your stick insects to change color. 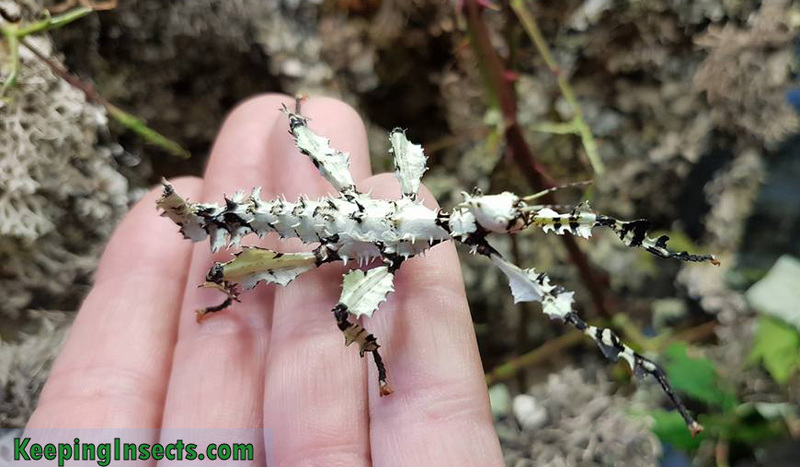 You can read more about getting the lichen color morph at: How to get the lichen color morph of the Giant Prickly Stick Insect. The difference between (adult) males and females is enormous. The females are bulky, thick and 15 cm long. They have lots of spines on their back and large lobes on their legs. The males are really slender, have little spines and reach a length of 12 to 13 cm. The adult males have long wings and are able to fly, while the females have small wings (about 1 inch long). This is the head of a subsubadult female nymph of Extatosoma tiaratum. 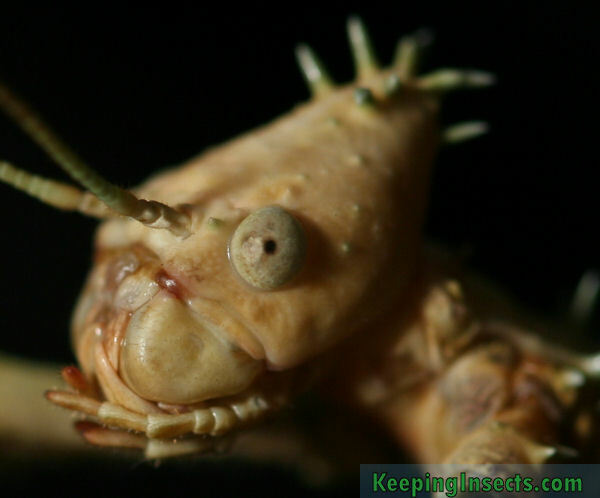 Like most stick insects this species is docile by nature. It is nocturnal and will generally only move during the night. It has an amazing defense strategy: it will mimic a scorpion when threatened. If they are disturbed, they will curl up their tail to mimic a scorpion. Sometimes they will even raise their front legs to mimic the shears of a scorpion. Predators who are interested in eating a stick insect, see a scorpion and are not willing to take the risk and attack a poisonous scorpion. 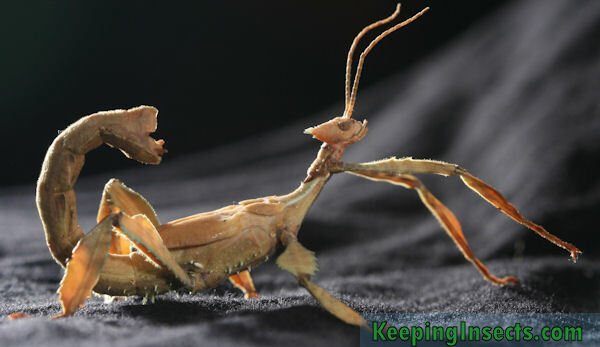 The stick insect is harmless but just uses its tail to bluff off predators! This is a subadult male nymph of Extatosoma tiaratum. Extatosoma tiaratum eat the leaves of blackberry, raspberry, oak, rose, hazel and eucalyptus. In the winter you can still find fresh blackberry leaves outside. Beware of leaves from the store, which are sprayed with insecticide! Eucalyptus is often untreated, but for safety you should always inquire at the store. This is a subsubadult female nymph of Extatosoma tiaratum. Notice the difference between this female and the picture of the male nymph posted above: males have a much more smooth skin without many spines. You can keep these stick insects at a temperature between 20 ° C and 30 ° C. In the night the temperatures can be allowed to drop a bit more. This species does not have high demands regarding air humidity. They must have some water to drink almost every day, you can supply this by spraying with water onto the leaves they eat. Nymphs need more humidity than adults, because molting is easier with slightly higher humidity (around 60%). Ventilation is very important, a too humid environment without much air flow is a common cause of death for these animals. 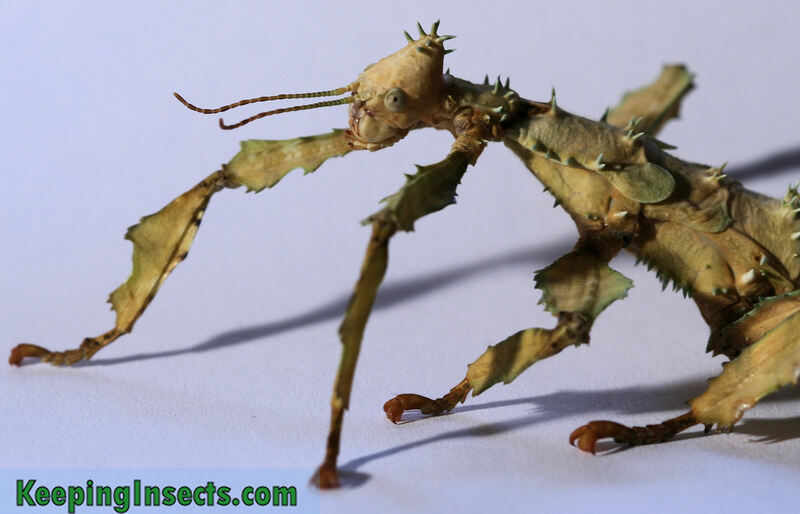 As with all species of stick insects, the Giant Prickly Stick Insect needs an enclosure that is at least 3 times the length of the animal in height, and at least 2x the length of the animal in width. For an adult female this means at least 45 cm high (about 18 inch) and 30 cm wide (approximately one foot). When the females are very large and heavy, it is difficult for them to climb onto glass. It’s better for your pet if you provide it with a rough surface to climb on on the side of the tank. The top of the tank should also be made of netting or a suitable rough surface to hang from, because this species often hangs upside down. Make sure the stick insects have enough strong branches with leaves to hang from and eat of. Side view of a subadult male of Extatosoma tiaratum. Males and females are easily distinguishable. Adult females are big, heavy and do not have large wings. The males are long and slender and have very long wings that reach past the abdomen. 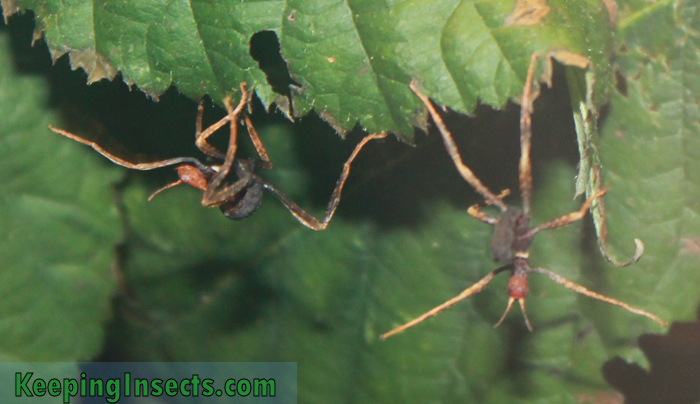 Males have very long antennae, this can already be seen in young nymphs (L5 onwards). The differences in size and body type become more and more evident as the nymphs grow. Extatosoma tiaratum can reproduce both parthenogenetically and sexually. When the female does not mate, she will lay eggs that develop into females. When she does mate, she will lay eggs that will develop into both males and females. The nymphs born from parthenogenic eggs are often weaker and the eggs need almost twice the time to hatch than fertilized eggs do. For breeding all you need to do is keep the male and the female together in one enclosure. When the time is ripe they will know what to do. 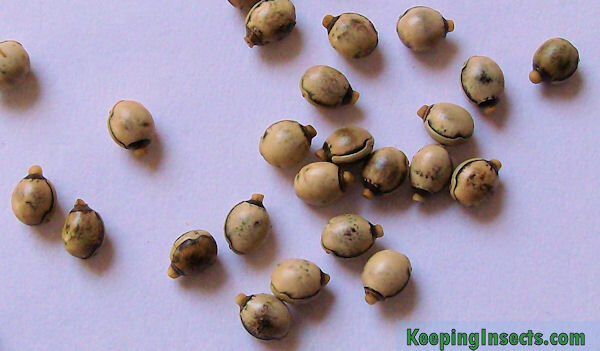 The eggs are round and slightly shiny, they can vary in color between beige, mid brown and dark brown. On the eggs you can see the operculum, this is a sort of hatch on the egg where the nymph will come out. You don’t need to be afraid that you will throw away the eggs as if they were droppings, because they look very different from the droppings. The eggs hatch after 4 to 6 months when the female is fertilized by a male. Parthenogenetic eggs, when the female has not been with a male, hatch after 6 to 12 months. Keep the eggs on a moist tissue paper at 25 ° C. Spray every few days with water, but allow the paper to dry completely before spraying again to prevent mold. Mold can be more destructive than keeping the eggs too dry. When nymphs hatch but walk around with the egg case still attached to a leg, you are keeping the eggs too dry.